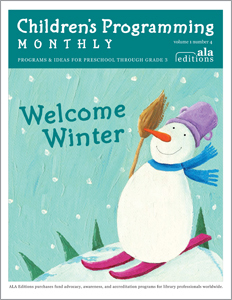 Children’s Programming Monthly subscribers can access the November issue and our 12-month archive at http://alaeditions.org/cpm. The November issue, Me, Me, Me, focuses on one of a child's favorite subjects: ME. From exploring how the body moves and putting names to feelings to becoming more independent, the programs, listed below are spot on. Where is Your Belly Button / Donde esta tu ombligo? Not a subscriber? Learn more and subscribe today. Do you have a successful storytime program to share? Send it to me via e-mail. If it’s selected for publication, we’ll send you a free-one year subscription to the online magazine. All submissions will be acknowledged promptly, and authors will be notified within three months if their program will appear in print. Looking forward to hearing from you…. Activities and books must be appropriate for children preschool through grade 3. Along with read-aloud suggestions, programs can include songs; activities (musical and/ or, movement); rhymes; flannelboards; crafts; fingerplays; lists of additional books or recordings; early literacy information; and parent follow-up activities. Submissions must be accompanied by the author’s name, mailing address, e-mail, daytime phone, and, if applicable, library affiliation. Illustrations (no photos, please) will be accepted on the basis of quality. Simple diagrams or patterns work best. They should be drawn with black ink on plain white paper and scanned at 300dpi. If electronic submission or artwork isn’t possible, illustrations can be sent separately, to Stephanie Zvirin, ALA Editions, 50 E. Huron, Chicago, IL 60611. Please do not bend or fold the illustrations. All book suggestions must include the author’s name, publisher, and date of publication. Recorded song titles must include the names of the recording and the recording artist. Previously published programs can’t be accepted. I'll look forward to hearing your ideas! I don’t know what it’s like where you live, but in Chicago it’s 15 degrees. Our Midwestern weather is one of the reasons the new issue of Children’s Programming Monthly is dedicated to Old Man Winter and his frosty friends. Not everybody celebrates snow, but it seems enough Editions authors do to enable us to present you with a wonderful array of programs that make the most of bright, snowy days. We can stay toasty indoors while sharing Kathy Macmillan’s comical prop story “Getting Dressed to Play in the Snow” or singing along to Rob Reid's gleeful snow-themed adaptation of the old camp song “Do Your Ears Hang Low.” Patterns to outfit a flannelboard snowman, early literacy link for preschoolers, a wealth of books to share…you’ll find it all in this month’s issue. You can purchase a single copy of this issue or subscribe to Children's Programming Monthly at the ALA Store.